FRANKLINTON—A Washington Parish jury found John Peters, 20, of Angie, guilty Friday (April 22) of three counts of attempted second degree murder for a pre-dawn shooting at a Bogalusa motel in August 2014. Peters faces from 10 to 50 years in prison without the benefit of probation, parole or suspension of sentence when he is sentenced June 30 before District Judge Richard Swartz. The jury took a little more than an hour to return the guilty verdict against Peters, who was one of three men involved in a shooting at the Sportsman Inn on Highway 21 in Bogalusa about 3 a.m. on Aug. 26, 2014. The men, all dressed in black and wearing gloves and masks, carried an assortment of guns, including an M-4-style assault rifle as they approached a second-floor room. They then began firing into the room, which was occupied by a man identified as Larry Alderson, now 40, of Pomona, California, his girlfriend, and her 6-year-old child. About 30 casings from the weapons were deposited in the parking lot. None of the room’s occupants was injured, but one of the suspected shooters was inadvertently struck by gunfire from one of the other two masked men. The injured man was brought to Our Lady of the Angels emergency room with a gunshot wound to the abdomen. The Washington Parish Sheriff’s Office investigated, and Detectives Robert Harris and Corbet Hunt quickly recovered the weapons used in the attack and identified Peters and the other two men as suspects. Ballistics on the casings at the scene and DNA samples linked Peters to a 9 mm weapon that also had been used in the shooting. Peters later confessed to police that he had been involved. Police believe the shooting was drug-related. 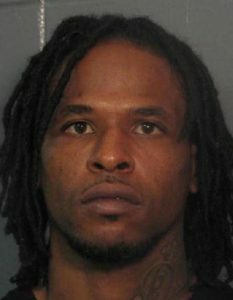 About three weeks after the motel shooting, Alderson, who had been inside the motel room with his girlfriend, was charged with first degree murder and attempted armed robbery in a separate case. The shooting victim, identified as Jonathan Roberts, was found Sept. 13, 2014, in the back yard of a United Methodist Church in Bogalusa. He had been shot in the head. 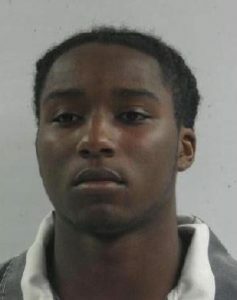 An investigation by the Bogalusa Police Department led to Alderson, who had fled to Mobile, Alabama. Alderson was brought back to face the charges, and last week on April 18, he pleaded guilty to manslaughter and attempted armed robbery in the case. District Judge Martin Coady sentenced Alderson to 40 years for the manslaughter charge and 10 years for attempted armed robbery. The sentences are to run consecutively for a total of 50 years. Assistant District Attorney John Alford handled the case against Alderson.